Home » Blog » Saving the world! The book Limits to Growth (Matthews, 1972) is the result of a study commissioned by the Club of Rome. It examines the inevitable collision of the exponentially growing human population with limited resources. 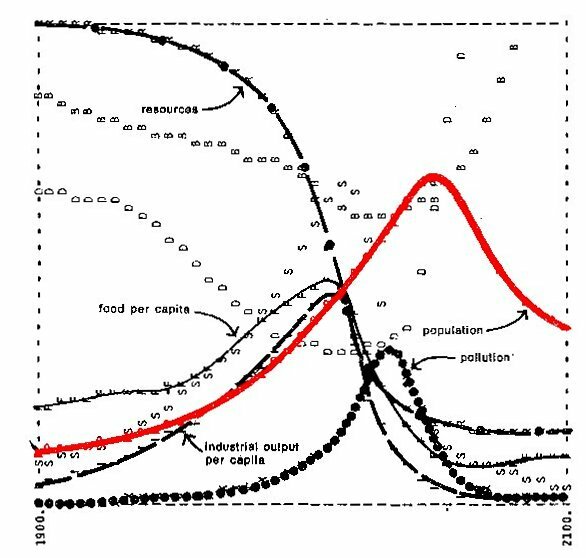 As shown on the graph there is a drastic reduction in human population, shown by the solid line, once demand has overtaken supply. And this is the best case scenario. The worst case scenario is a global conflict over who gets the dwindling resources. This is what Grint (1973, 12) calls a ‘wicked problem’: meaning it is complex, it has not occurred before, and there is no logical way of puzzling out how to solve it. In other words, there is no scientific way to determine the solution. By egoism he means not just an exaggerated self-importance, but the ethical belief that self-interest is the just and proper motive for all human conduct. This transformation would solve the problem. If a general evolution beyond egoism could be achieved, this would swiftly bring an end to poverty worldwide. As Tomas Pogge explained in his RSA Lecture (2012), had the wealthiest 5% of the global population donated just their gains over the last 17 years to those most in need all over the world, severe poverty would already have been eradicated. 1.5 billion people’s lives would have been transformed. And this is the automatic result of evolution beyond egoism. Applied globally, this solves the main problem; and we know this is entirely feasible; it is only the decision to make it happen that has been lacking. Additionally, a fully cooperating global culture would be able to accommodate a significantly larger population on the planet. This will this tide us through the most difficult period of all, while we ease the population growth to slow and stop. How can we make this all happen? What could possibly make people change in this fundamental manner? The kind of transformation King is talking about is usually the result of years of dedicated spiritual practice. However, as it happens, we are in luck. This change is exactly what happens naturally, as one comes to understand what the new physics is actually telling us about the true nature of reality. Firstly, reality is personal: it is only what one has personally observed that is ‘determinate’ – meaning physically real and definitely so – in this version of physical reality. This is not a new idea. This is simply what undaunted physicists, such as Carlo Rovelli (1996), Lev Vaidman (2008) and Hugh Everett (1957), are actually saying. This is the first step in resolving the major paradoxes in both relativity and quantum mechanics. For almost a hundred years, these have proven insoluble within the field of physics. Systems analysis, in terms of the logical types of the methodology of Bertrand Russell (1908), shows us why. Experiential reality is not a subset of physical reality, but its determinant. In this kind of reality, the whole world is intensely personal; and the full implication is as bizarre as it is revolutionary. In this kind of reality, silly though it sounds in our modern technological age, karma is not just some odd, misguided idea of a primitive people: it is a real operational phenomenon, meaning that your relationship with every aspect of the world directly affects which version of this world you are likely to experience in the future, with regard to every aspect of the world, however apparently remote. Once I realise that I am in a realm of karma, cooperation and seeking the best for everyone is directly in my own best interests. And living at the expense of others is directly in my own worst interests. Egoism is potentially disastrous. In a domain of this nature, to take more than one gives is to impoverish every aspect of one’s life; but to give more than one takes is to enrich every aspect of it. In other words, living for the good of all is the best one can possibly do for oneself. Just this knowledge begins the evolution beyond egoism that King calls for. The whole world becomes important to me in the same way that I myself and my family are important. In this amelioration of egoism, a new agenda is born: one that means everyone does OK. For each individual, this is part of a process of personal evolution. With respect to society, this brings about a new age in the global culture. Poverty is eliminated, and we manage the limits to growth peacefully, cooperating to make it work for everyone. There is a new age of humanity.